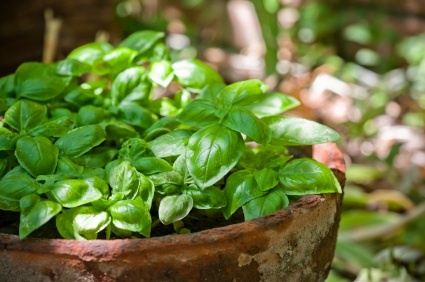 Basil is one of the essential Italian herbs and is very easy to grow. Genovese basil, with 2-3 inch long, dark green leaves, has a spicy, fragrant taste. Use for pesto, sauces, and general cooking. Lettuce leaf basil has a larger leaf (4-5 inches), is lighter green, and has a sweeter, less intense taste. Use fresh in salads, on crostini or bruschetta, or for general cooking. Both plants grow 18-24 inches high. Picollo has a small, almost round leaf, an intense basil flavor, and grows in a round bush shape. Culture. Basil is a warm-weather plant and cannot take even the slightest frost. Basil likes a well-drained, moderately fertile soil with good sun. It does very well grown from transplants, but you can also direct seed it. For transplants, start about 5-8 weeks before the last frost date. Put 5-6 seeds in a 4” pot covered with a thin layer of vermiculite or fine compost. When the plants are about 2" high, either transplant them to individual containers or thin to three plants and let them keep growing. Set out basil (or direct seed) about the same time you put out tomatoes. Space plants about 12" apart and keep well watered. Basil will grow well in containers. Use at least an 8" pot with a good fertile soil for container grown plants. Pinch off any flower stalks. Diseases and pests. Nothing much bothers basil. Even a woodchuck won’t eat them, so you can plant them outside the fence. Harvest, storage and use. Harvest by pinching whole sections of the plant. This will encourage branching. Pinch off any flowers that begin to form. You can be quite aggressive with harvesting, since the plant will regrow quickly. Sometimes it is useful to plant a second group of basil in early to mid July. Your initial crop will be a bit woody by mid August. You can dig this second group up before the first frost, cut them back, pot them up and bring them inside and enjoy a few more months of fresh basil. Use Genovese basil in fresh tomato salad, pesto, general cooking, herb fritatta; use lettuce leaf basil in salads, on crostini, as a ‘wrap’, or general cooking; use picollo where you want a really intense basil taste. To store, stand in a glass of water on the kitchen counter, like a bouquet. Or rinse and store in the crisper section in a plastic bag. You can dry basil, but it really does not have the same flavor. To store for cooking over the winter, try blending it with some water and freeze in ice cube containers. Then put the cubes in a plastic bag or container and return to the freezer.